If you didn’t watch the Live Ocarina concert tonight, you missed out on a real treat! The trio of Ocarina, Piano and Violin (The St. Louis Ocarina Trio) provided a solid hour of peaceful, and at times, upbeat music ranging from songs from The Legend of Zelda, to Final Fantasy, to The Beatles and more. The hour went past far too quickly, leaving the stream’s chatters wanting more – which is only a good thing really. Despite some very minor initial lag, and some sound difficulties with the violin, this was well worth watching – or more accurately – listening. Despite the minor technical glitches, I was very pleased with the seemingly professional production value. More pleasing than that was the very music itself, of which I cannot find any fault. The trio are all very well established musicians. As Zelda fans we were treated to Zelda’s Lullaby, Dragon Roost Island, Saria’s Song and also Gerudo Valley during the credits. It would have been great to see more Zelda, but as a musician I know that the criticism of being limited and only able to play one style is not a pleasant one. 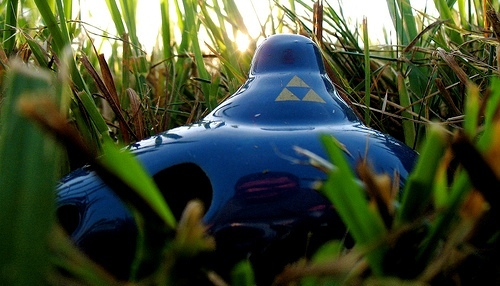 Generic ocarina music is considered to be Zelda music these days, so the trio wanted to show their varied ability, which they do greatly. When listening to classic Zelda songs such as Zelda’s Lullaby usually when I hear some improvisation it turns me off quite a bit, but here Heather blends the innovation so seamlessly into her playing that it is a real tribute to both the music of Zelda and of her own ability. Around 100 viewers were tuned in to this unique live concert, and frankly, that was far too few for such a show. Topped off with giveaways, it was a commendable performance. No doubt it’s a unique medium to have a live concert via web-cast, and it seemed kind of strange not to have an applause at the end of each song, especially when it was deserved. Now that it’s over, all that I can really recommend is to go and download the album “Echoes of Gerudo Valley (Music from “The Legend of Zelda” On Ocarina)” on iTunes. 24 classic Zelda songs on Ocarina with accompaniment – what’s not to want? We’ll be sure to keep an eye out for Heather and the trios future work, and you should too.